David Sedaris just released a new audio book of live readings last week, and, in addition to the CD and digital download, his publisher has just announced that the title will be available in a more “unexpected” format come the new year. 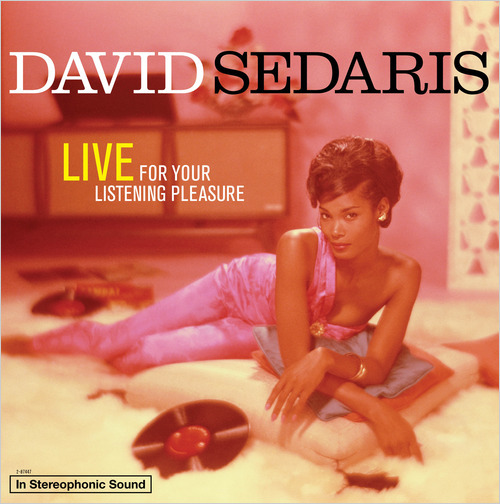 …Hachette Audio recently announced that the latest audiobook by David Sedaris, “Live for Your Listening Pleasure,” which features readings before audiences, would be available on the least portable of formats: vinyl. Reminiscent of Blue Note albums from the 1950s and 1960s, the cover features a photograph of a woman sprawled on a white shag rug with a come-hither look, albums strewn about. To win a copy of Live for Your Listening Pleasure on vinyl (includes a free digital download code), fill out the entry form after the jump. Contest ends on December 18, 2009, 1 entry per household, US entrants only. More NYC-less David Sedaris US tour dates after the jump.